Best known for his work with The Allman Brothers Band and Government Mule, the late great bassist Allen Woody, who passed away in August 2000, was an avid collector of vintage Epiphone basses. The Epiphone Allen Woody Rumblekat electric bass guitar is the legendary musician’s signature model, and combines the features that Woody found best suited his aggressive, rumbling playing style. In order to give the body a distinctively large character, the Rumblekat has 2.1" thick sound chambered mahogany body without f-holes. The combination of dense mahogany with the chambered shape allows this bass to generate masses of energy, forming the foundation of its solid, uncompromising tone. The top is made from 5-ply flame maple, which produces a crisp balance against the power of the body. Epiphone have gone to great lengths to ensure the Rumblekat looks every bit as good as it sounds. The body top is finished in a subtle wine red finish, with white binding around the edges that leads onto the translucent finish of the back and sides, proudly displaying the natural grain of the mahogany. The neck is made from mahogany, and set along 30" short-scale to make it easier to play. Paired with the neck is a sleek rosewood fingerboard, home to 20-frets that feature white dot inlays for easy navigation. To deliver the customary fat-yet-tight tones that Woody was renowned for, the Rumblekat has been fitted with NYT mini-humbucker bass pickups in the neck and middle positions. The smaller size, narrow magnetic field and unique design, means that the pickups produce bright tones with an incredibly focused output. Using a design that includes enamel wire, along with bar ceramic magnets, the pickups retain their hum-free capabilities with ease. Subtle attenuation of the master tone knob, and the individual volume pots for each pickup, gives a substantial level of tonal control. Whether you’re looking for earth-shaking rumble, full sounding open notes, or tight high-end notes, the NYT pickups can do it all. The Epiphone Allen Woody Rumblekat bass guitar is a fitting tribute to the legendary bassist. The finish is simply breathtaking, with every detail coming together to create a visually striking bass. The robust timbre of the tonewood combination is communicated with clarity by the NYT mini-humbuckers, with deft control enabled by the simple electronics layout. If you’re looking for a truly unique model that matches your passion to perform, then this is the model for you. Posted on 27/03/2019 by Axis This is a cracking bass. I've been playing this bass in a covers band for the last couple of years. I use it for approx 50% of my set (I use a Jazz with Flats for the rest). The build quality and finish is excellent for the price although not perfect. The pick ups are very nice and give something different if you are used to a P or J sound, especially the neck pick up (what a rumble,). I use this bass for rock (with a pick as Woody intended! ), blues and ska. I wouldn’t sell this bass on, it’s worth way more than the MRSP, buy it whilst it’s still available. Posted on 14/01/2018 by Duggie I bought one of these when they first launched and won't trade it. Very well finished Epiphone, worthy of the Custom Shop brand. It's a short scale model with a hollow body (but no cutouts) so it tends to be compared with a Hofner violin bass. I think this one wins! The neck has a much wider profile, the humbucker pickups are very powerful but easily controlled with two volume and a single tone. The 3-point floating bridge is good and works well here - the fit is better than on a couple of Thunderbirds I've played. It sits well with a wide leather strap - no neck dive! The gold hardware and the binding against the deep red translucent lacquer give it that classic Gibson look, worth much more than the ticket price. Posted on 06/10/2017 by Morrismusicpete I bought one of these back in 2003, when I was a student. I was inspired by Charlie Colin (who used to play bass in Train) to buy a hollow body bass; he played a Gretsch Broadkaster bass on the Drops of Jupiter album. This bass could compete with my USA P Bass in terms of aggressive pick-playing growl, but was also capable of producing a warm tone akin to that of a Hofner violin bass. The short scale length neck was a joy to play and the weight of the instrument was perfect for two 45 minute sets of live music! I foolishly traded this bass for a different bass many years ago (misspent youth! ), however I am planning on getting another Allen Woody bass when I can. 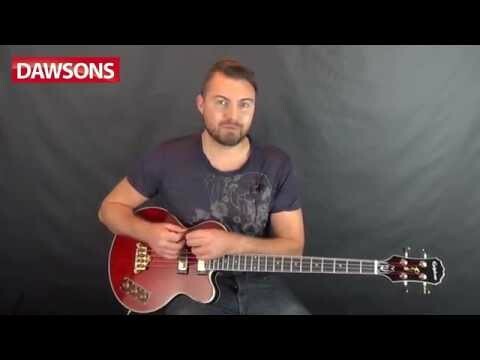 Posted on 04/11/2011 by nickhardshore This is a fantastic-sounding bass from the artist Allen Woody. It will produce some soft woody bass tones and a nice low end complements the static pick bass that you will no doubt want to do. The bass will play that much loved E-string ostinato and also includes dual volume controls and a single tone control. You can adjust pickup balance between the two mini humbuckers and the tone control doesn’t really get used.